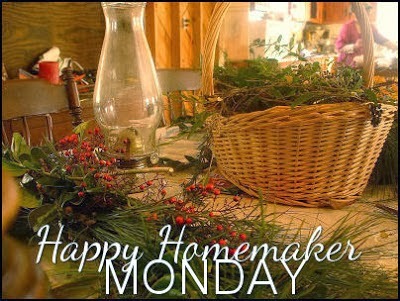 It's Monday and time for Happy Homemaker Monday hosted each week by Sandra at Diary of a Stay at Home Mom. Watching Shark Tank on You Tube:) I love this show but didn't realize you could watch it on You Tube. I think I will watch a little more Shark Tank on the computer or read tonight. Hubby will be gone most of the week so I won't be planning a menu; just eating whatever I feel like...staying within my Weight Watchers Points, of course. Hubby just went grocery shopping today so will have lots of great food to eat, especially fresh things. Looking at cookbooks and knitting/crocheting magazines. One worm CAN spoil the whole apple! Don't ask me to explain!!! Hi Kat - Sounds like you have a good week planned. I love The Book Thief. What a touching book. Hope you like it too. I also love Amish books! Stay warm and enjoy a week to yourself! It should be a good week:) I am looking forward to reading The Book Thief--it came highly recommended. I hope you have a great week as well! I can't recall the last day when we weren't seeing at least some snow falling. We don't get a lot of snow here but it's pretty when it happens. We live in a high desert area so we get the cold but not the moisture. You have had an amazing amount of snow!!! from a fellow snowed in Happy Homemaker! Hope your week is great! Thank you Conny! I hope you have a great week as well!